There is an article in the September, 2017 issue of the IBPA Independent magazine, ‘Can the Espresso Book Machine Save the Indie Publisher?’ It is written by Peter Goodman, the publisher of Stone Bridge Press in Berkeley, California, and a member of the IBPA Independent Editorial Advisory Committee. The article tells us that “the EBM is a self-contained, on-demand printing and binding machine that can produce a single perfect-bound book from a digital file in 5-8 minutes. A product of On Demand Books in New York City, the EBM promises ‘Books Printed in Minutes at Point of Sale for immediate Pick-up and Delivery’. The article also mentions that the machine can be promoted to anyone who simply wants to get unpublished written material into a printed and bound format: family cookbooks, memoirs, school projects first novels, etc. “Another reason that book machines have started to come into their own is that publishers are looking for ways to support bricks-and-mortar stores. Publishers cannot afford to lose retail distribution. So they also see this as a mechanism for the distribution model. The desire to keep indies in business is translating to a new willingness to make content available. 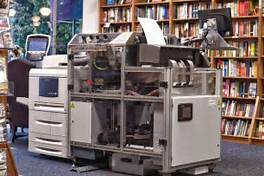 To date, most of the books that the machine can print have come from deep backlists. Most frontlist titles are from smaller presses and open source publishers. “A question put to attendees at Xerox’s first Thought Leadership Workshop about the EBM in Rochester, N.Y., last month indicates another possibility for the machine’s growing popularity: Amazon. “We need to compete with Amazon,” says Linda Gregory, who handles Web site and order fulfillment for Colgate Bookstore in Hamilton, N.Y. In doing some research for this post, I found that the price of an EBM is $185,000, but I feel sure that On Demand’s preference is to enter into lease and maintenance agreements.